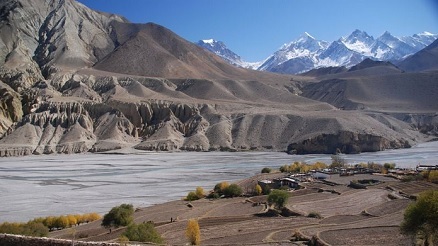 Mustang region is a very preserved area located in the western part of Nepal. 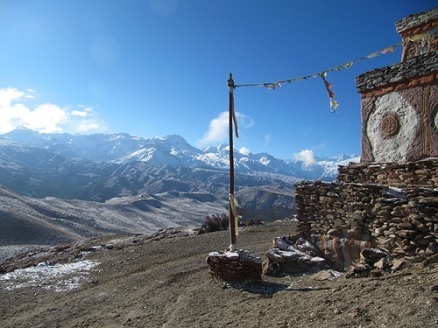 With the frontier with Tibet the Mustang region gets a huge influence of Tibetan Buddhist. The region is very dry which allows pleasant trekking with very clear views. 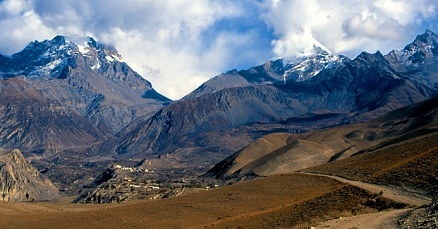 Mustang has been described as a thumb like part of Nepal extending into Tibet. Strong winds usually howl across the area in the afternoon generally subsiding at night. lo has much less rain than the rest of Nepal during the monsoon. The scenery includes spectacular mountain views of Dhaulagiri, Tukuche peak, Nilgiri peak, Brikuti peak, Saribung peak, Tilicho peak, Thorong peak... 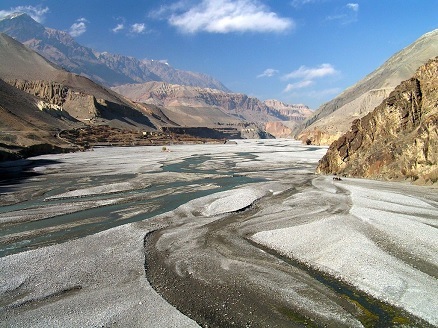 The beautiful Kali Gandaki river originates in Mustang and continues in the deepest valley of the world between the Daulagiri range and the Annapurna range. 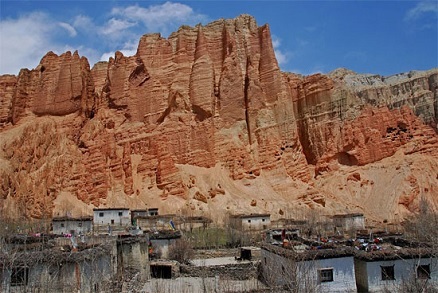 In lo itself the countryside is similar to the Tibetan plateau with its endless expanses of yellow and grey hills eroded by the wind. 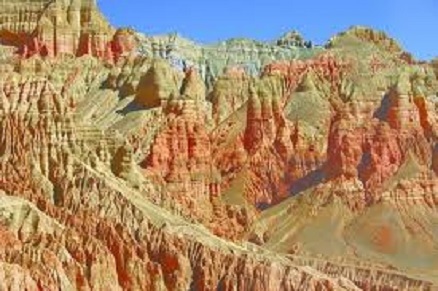 There is more rain in the lower part of upper mustang and the hills tend to be great red fluted cliffs. Mustang has distinct species of flora and fauna that are not found anywhere else. The range of geographical and climatic regions has led to a diverse variety of flora and fauna. The natural vegetation changes from the tropical species to more temperate stands of forest trees including oak, beech and rhododendron. Local habitants of Mustang are Gurung, Dalit, Thakali, Thakuri and Tibetans. Due to the lack of rain, houses and temples are built with rammed earth or sun baked bricks of mud on a stone foundation. Astonishing edifices such as the city wall and four storey palaces in Lo Mangthang are built in this manner. 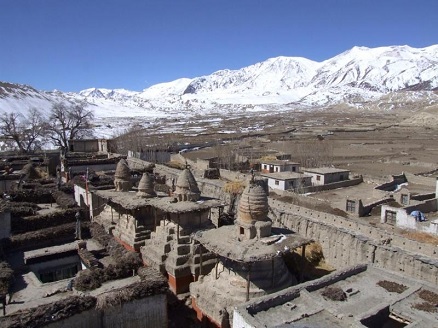 It is said that there were once large forests in Lo Manthang but now wood for construction is hauled all the way from Jomsom or is coming from pruned poplar trees that are carefully planted in every village. In the 1990s much of the wood, including the timbers used in the restoration of thubchen Gompa was brought from Tibet. It is interesting to note that the foundation of many building are built from round boulders. The people raise yaks, goats and sheeps and farm buckwheat barley, wheat and mustard. The harsh conditions allow only one crop a year. 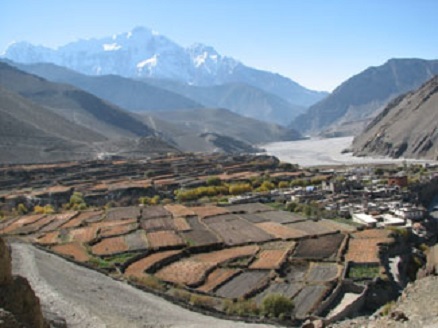 Except in villages many resident leave Mustang between November and March to sell sweaters in southern Nepal or India or to work in Kathmandu. In general Mustang population is in decline. There are 4 major temples Jhampa Lakhang, Thudchen gompa, Chode gompa, Choprang gompa. 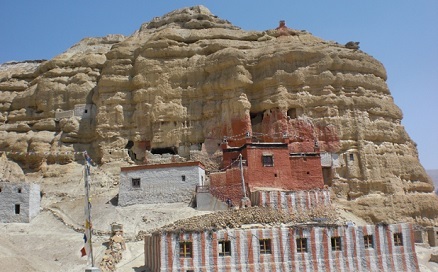 Although there are Gelug and Nyingma school gompas in Mustang the primary form of Tibetan buddhism practiced in Mustang is that of the Sakya lineage. Lama Ngorchen kunga Sangpo introduced the Sakya tradition to Lo during three visits between 1427 and 1447. He was the head of the Ngor sub school of Sakya Buddhism and this is the tradition followed in Mustang today. Lo Mangthang is the highlight of this trek so don't scrimp on your time here. With a handful of temples and the the raja's palace in town plus some sites in the surrounding area, there's enough in and around Lo Manthang to keep you occupied for a couple of days. Day 1: Kathmandu to Pokhara 800 m by flight (30 mn). Day 2: Pokhara to Jomsom 2720 m by flight (35 mn). Day 3: Kagbeni to Chele 3050 m (4-5 hrs). Day 4: Chele to Syanboche 3800 m (5-6 hrs). Day 5: Syanbochen to Ghami 3520 m (4-5 hrs). Day 6: Ghami to Chrang 3560 m (4-5 hrs). Day 7: Chrang to Lo Manthang 3810 m (4-5 hrs). Day 8: Rest day in Lo Manthang and visit around. Day 9: Lo Manthang to Ghami 3520 m (5-6 hrs). Day 10: Ghami to Chhusang 2980 m (5-6 hrs). Day 11: Chhusang to Jomsom 2720 m (5-6 hrs). Day 11: Jomsom to Pokhara by flight (35 mn). Day 12: Rest day in Pokhara. Day 13: Pokhara to Kathmandu by flight (30 mn). There is no difficulties for this trek. 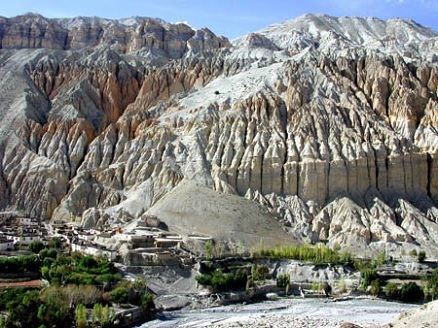 As a restricted area, Upper Mustang requires a special trekking permit. Mustang's status as a kingdom ended in 2008 when its suzerain Kingdom of Nepal became a republic.